If you are looking for a turtle to have as a pet, wood turtle is one option that should be on the top of your list. They are usually friendly and tame, unlike others that can be aggressive, especially when they are disturbed or held. These turtles are largely terrestrial, often found in the Northeastern part of the United States, as well as in Canada. The degradation of their habitat is a significant threat for these turtles, which is why they are already protected by law. Scientifically, the wood turtle is also known as Glyptemys insculpta, which also speaks a lot about its physical appearance. In Greek, giypt means carved while emys means turtle. On the other hand, insculpta is a Latin word that literally translates to engraved in English. It has concentric rings in its shell, which looks like carved wood, which is why it has been named as such. Wood turtles are known for being medium-sized, which is also one of the reasons why they will make great pets. The adults will be approximately six to ten inches in terms of length. Meanwhile, the weight can be up to 1.5 kilograms on average. When it comes to color, the carapace of a wood turtle is usually grayish brown or brown. You can also see black and yellow lines on its ridges. Meanwhile, the inside of the shell, which is called the plastron, is yellow with oblong blotches. Wood turtles are known for being diurnal, which means that they are most active during the day. During the winter, on the other hand, they can be found hibernating. When the weather becomes too cold for them, the wood turtles hide in streams and rivers, among other places where the water won’t end up freezing. Usually, they are foraging early morning and late in the afternoon. They also take time to relax and bask under the heat of the sun. This is a way for the turtle to maintain the right temperature of its body, which is also technically known as thermoregulation. In the wild, the wood turtles are commonly found in Nova Scotia, Michigan, Minnesota, Indiana, and Virginia. Meanwhile, it is also said that 30% of its population is in Canada. They live in streams with slow motions, usually those with vegetated banks and sandy bottoms, which they like for overwintering. They also love rivers with logs and banks, which will provide them with an area for basking. Wood turtles also live in herbaceous vegetation, which provides them an area for foraging. Custom made enclosures are necessary if you are taking care of a wood turtle as a pet. The size of which will depend on the age of the turtle that you have. Also, because they live both in land and in water, the water should have a depth of about two feet and there should be an area where they can climb if they are looking for a dry spot for basking. It will also be best if the enclosure is placed outdoors when the turtle is already mature. It is also important to note that wood turtles are omnivorous, which means that they can eat both plants and animals. Also, they can eat in and out of the water. Some of the foods that they commonly eat include earthworms, snails, berries, fungi, algae, aquatic crustaceans, apricot, grapes, cherries, apples, carrots, hard-boiled egg, chicken heart, and even dead animals. Is one of the best supplements that you might want to consider giving to wood turtles. 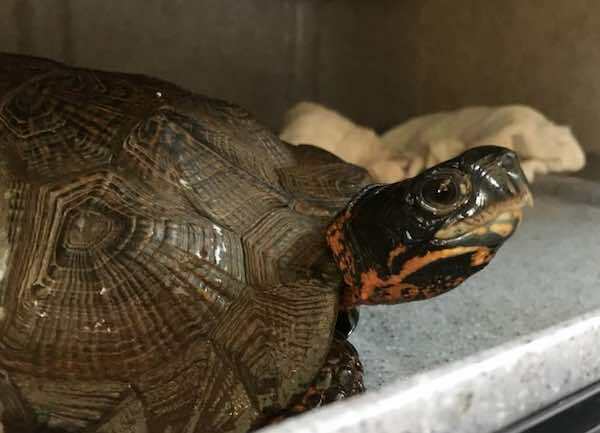 Similar to other turtle species, one of the most common problems would be shell infection, parasites, Vitamin A deficiency, and respiratory diseases. Often, they can get this problem when the water or their habitat is not properly maintained. Eye and ear infections, as well as kidney diseases, can also be common problems, which are often caused by low humidity levels. When they cohabit with other turtles, there is also a higher likelihood that they will exhibit a number of health problems. Exposure to natural sunlight is important for their health and survival. If they are indoors, an artificial light will be necessary. Keep the temperature of their enclosure anywhere from 70 to 80 degrees Fahrenheit. However, for their basking spot, it can be as high as 90 degrees Fahrenheit. During the day, it will be best to use incandescent bulbs. On the other hand, during the night, you can switch to ceramic heaters or reptile night bulbs. Females and young wood turtles can usually live in the same enclosure without any problem. However, it is still advised that you keep a watchful eye since adults can be aggressive. Also, males are known to be vicious fighters. If the turtle is young, it should be fed at least once a day. On the other hand, in the case of the adult turtles, they are good enough to be fed once every other day.